This section begins with a worldwide list of all the Countries where there are graves of Commandos who died in service, or where those who have no known grave are remembered on Memorials. Every Cemetery or Memorial name opens to list all those buried or remembered there. 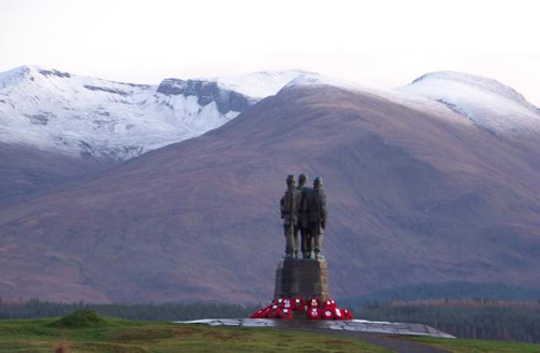 There is also detail about commemoration memorials to the Commandos such as at Spean Bridge in the area where Commando training began, and where large numbers of Commandos, their families, and their friends, still gather each November in remembrance. 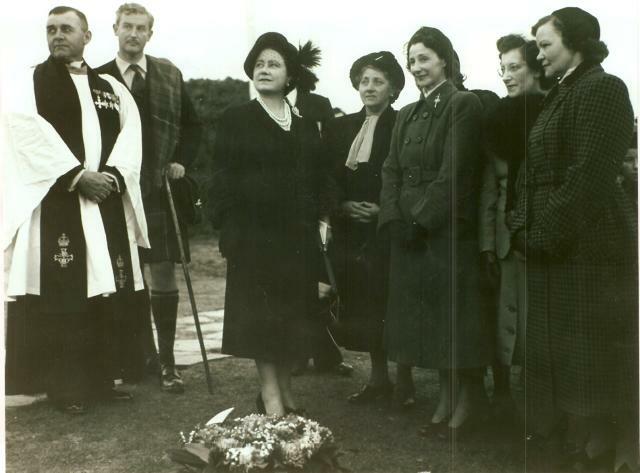 Additionally you will find guidelines that have been agreed on the scattering of ashes and the placement of plaques at the Area of Remembrance at the Commando Memorial, Spean Bridge. 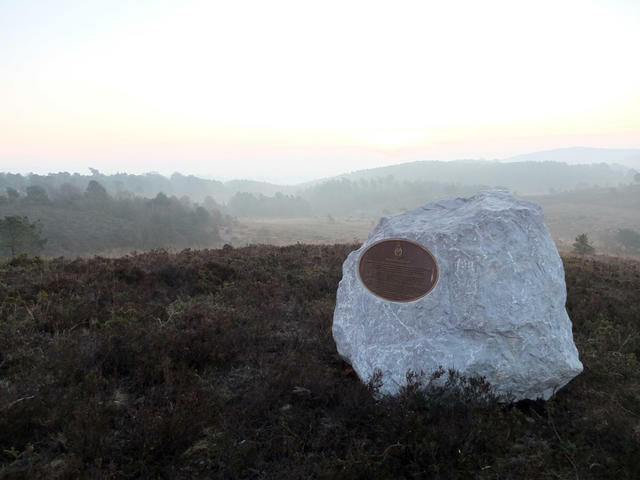 Detail relating to the Commando Memorial at Westminster Abbey is also included, as is detail of a new memorial to commando training, The Gibraltar Stone, on Woodbury Common near Lympstone . More detail about other Memorials will be added in due course. 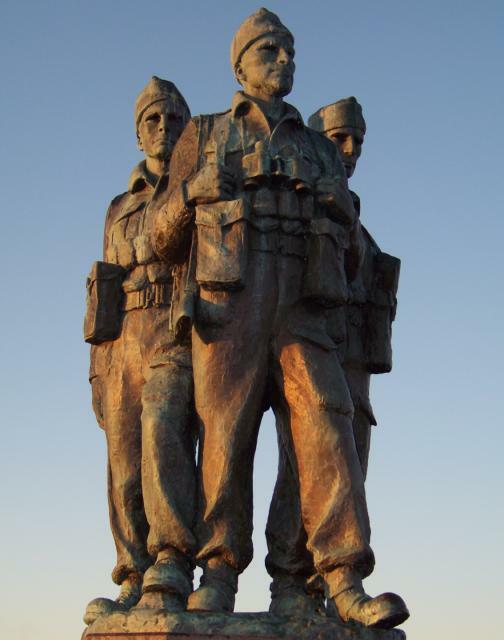 A full list of Commando commemoration memorials across the world can be found on page 30 onwards on this document about The Commando Association. Photo: John Mewett, Tim McKerrith, Frank Johnson (3Cdo), Fran McKerrith, Norris Pickford, Capt. Geoff Murray - the concept design and installation team of the Memorial. Written by CVA associate member John Mewett. 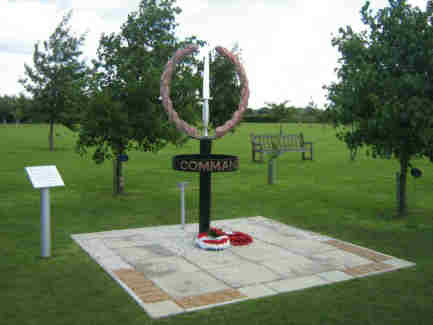 The CVA Memorial to the Army Commandos at the National Memorial Arboretum, Alrewas, was unveiled by HRH Prince Phillip on 29th July 2007. 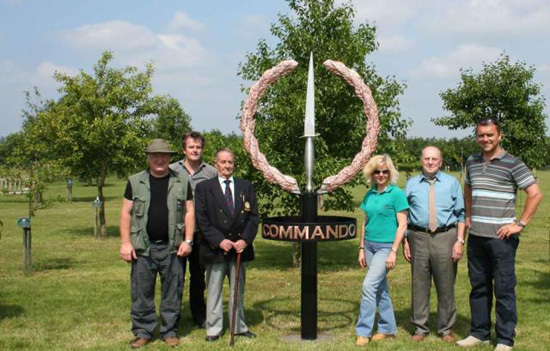 The idea for this installation was first discussed at the Lincoln Branch of the newly formed Commando Veteran Association in December 2005 and a motion passed and subsequently put formally to the National Committee CVA on 10th January 2006. The founder of the CVA Vic Ralph (1 Cdo), Deputy Chairman Lincoln Branch Frank Johnson (3 Cdo), and secretary of the Lincoln Branch John Mewett were then tasked by Stan Scott (Chairman) and the CVA National Committee, with bringing the project into being. The National Arboretum was visited on a cold snowy February morning and it was agreed unanimously that the CVA must have a presence there for the future. 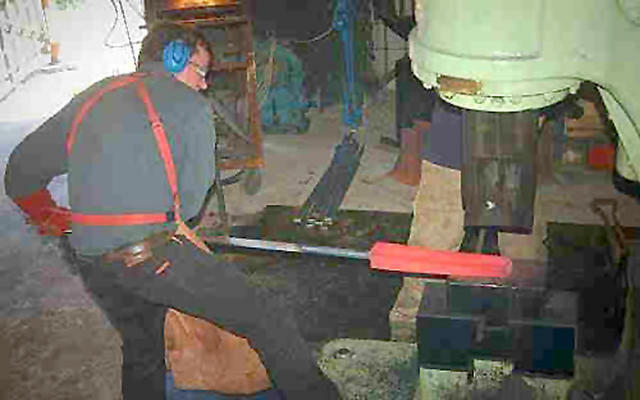 Engineer designer Norris Pickford was drafted into the team, Norris agreed to donate his time and services free to the project, he had designed similar works before and had long experience on working with metals and structures of the type envisaged. Many sessions were held with quite a few different designs being considered. A scaled down replica of the Spean Bridge monument was even spoken about and priced but it proved to be too difficult to realise. The final design as it is seen to today was decided upon because of the iconic status that the FS Commando Knife holds among all who have worn the Green Beret and it also provided a continuity link with the old ‘Commando Association’ who had used a similar design in the past, but had by this time stood down. Read about the origins of the fighting knife here: History of the Commando Fighting Knife. A drawing was completed and appointments were made to discuss the project with Paul Kennedy, grounds manager of the National Memorial Arboretum. Norris prepared a life size model of the proposed memorial centre piece from paper and card. On Paul enquiring ‘what do you have in mind’ Norris laid out the replica on the manager’s office floor. ‘That’s it ‘he said ‘life size’. A small silence followed. ‘Great I’ll put the wheels in motion’ came Paul’s reply. Anwick Forge in Lincoln was selected to create and assemble the centre piece and the team visited and explained the project to the talented and eager proprietors Tim and Fran McKerrith It was explained how important and revered the FS Knife, which formed the visual impact of the memorial, was to the soldiers of the commandos. Tim asked if an example was available and John offered his fathers (Bob Mewett’s No 12 & 1 Cdo) 1st pattern knife as a working model. Tim and Fran set to work. The FS and wreath centre piece comprises of the mirror-polished forged stainless steel FS Knife up scaled 4:1 to within 1/1000 of an inch, a replica of the original 1st pattern FS Commando knife. This four foot knife is surrounded by a wreath of 126 individually hot-forged copper leaves, thus reflecting the badge worn by all service personnel who pass the qualification to wear the famous Green Beret and also the wreath as worn by the former association’s members. After some research copper was chosen as the metal for the leaves of the wreath as copper naturally weathers to a green colour thus slowly producing an appropriately green colour wreath. A truly fitting and ‘living’ memorial. This structure proudly stands on a steel centre pole encircled by the word ‘Commando’ visible from both sides of the memorial. 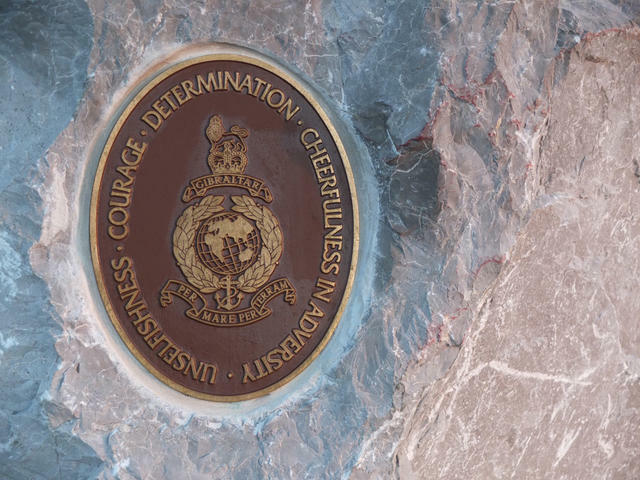 The letters of the words are again in copper and the font was kept bold and large symbolising the fortitude and strength of the Commando forces. Frank, John and Norris visited the Anwick Forge several more times and on a couple of occasions actually helping with the fabrication of the memorial as the installation day drew nearer. By this time Capt. (later Major) Geoff Murray had been elected as the new Secretary of the CVA and he took over the wheels of organisation. Capt. Murray arranged for a team of young soldiers to construct the initial brickworks and labbing and he also administered the final details for the unveiling ceremony including arranging for the attendance of HRH Prince Phillip and the overall culmination of the project. On that memorable day of 29th July 2007 the unveiling ceremony took place to an enthusiastic reception and the memorial has been a place of pilgrimage ever since. The CVA Army Commando memorial is close to the Royal Marines memorial. Unlike today, in WW2 not all Royal Marines were Commando trained. The two memorials now honour all who served as Commandos, both Army and Royal Marines. The initial installation has now evolved and includes seats, memorial paver blocks and in June 2013 the fabulous Walls of Honour were added which form a fitting backdrop to the beautiful FS Knife. The Walls of Honour carry the names of all the Army Commandos who lost their life whilst in Commando service during the Second World War. Anwick Forge were delighted to be asked to fabricate these to add to their initial work. Commandos, Armed service’s personnel and families from all over the world visit the NMA and the CVA memorial stands out proudly to represent the bravery and service of all who have earned the right to wear the coveted Green Beret. 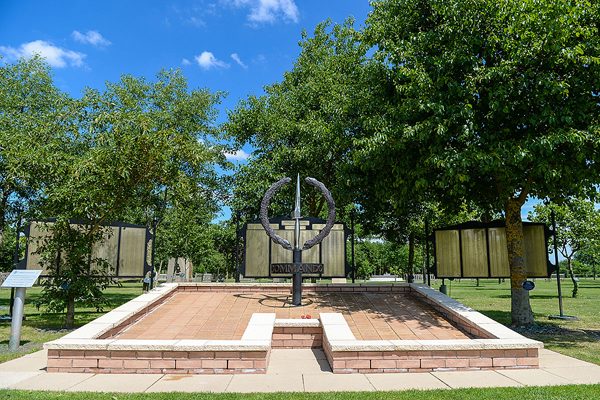 The CVA summer gathering is held annually at the memorial in July. Details of this can be found on our events page. Visit the Abbey's own website page for the Memorial [HERE]. 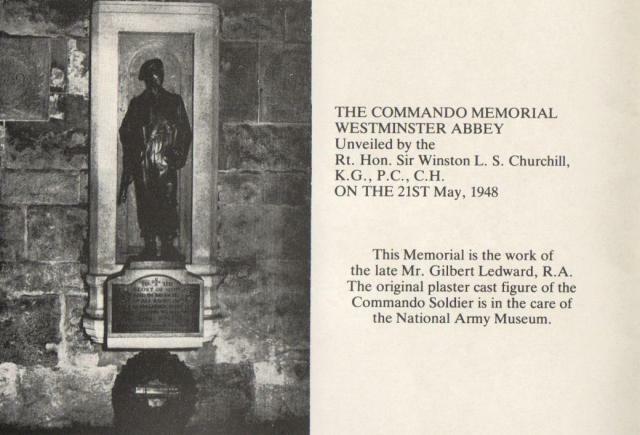 Mr Gilbert Ledward, R.A., picked a real commando for his model for a bronze figure he is sculpting for the commando memorial in Westminster Abbey. The model was Company Sergeant Major Ayres, who was in several raids on the Norwegian coast *. Mr Ledward is now finishing the clay model for a second figure, that of a parachutist. Model for this is 23-year-old Corporal H. Elliott, who wears the famous red beret when is walking out. In full parachutist's equipment and carrying a sten gun, he poses for five or six hours every day at Mr Ledward's studio. He finds it a little tiring, but nothing at all compared with the crossing of the Rhine, in which took part. The third figure will represent a sailor in the submarine service. Mr Ledward has not yet started work on this, and the model has not been chosen. The three figures will commemorate men who volunteered for some of the war's toughest assignments. Sculptor Ledward, a gunner in World War I, has been at work since Christmas on the volunteers' memorial which will stand in the Abbey cloisters. Each of the figures will about three feet high, and Mr. Ledward has designed limestone setting for them to blend with the cloister walls. He does not expect to finish the memorial until next year. The clay modelling for each figure takes from three to four months, and the casting in bronze also a long job.